If you look in my coat closet, you will see an arsenal of leashes. I have a leash for every scenario and size ranging from a 3-foot leather leash to a 100-foot para cord for when Bailey wants to take a dip in the water during a hike. Selecting a leash that “does it all” can be confusing, aggravating, and an expense! Ruff Rescue Rope is the most versatile leash I have ever owned. Ruff Rescue Rope eliminates the hassle of tangled leashes and buying multiple accessories for your dog(s). One leash can do it all! Ruff Rescue Rope gives back, too. For every 20 leashes sold, Ruff Rescue Rope pays the adoption fee for a dog out of the shelter and pairs them with a veteran suffering from PTSD or in need of a companion. Ruff Rescue Rope leashes are made from rock climbing rope which is extra-strong, waterproof and durable. It will last more than twice as long as a regular leash. Ruff Rescue Rope leashes are very easy to clean. Simply rinse the rope with warm water and swish it around in a mesh bag and continue to clean until the water is clear. Hang to dry away from sunlight and you’re ready to go! I received the Ruff Rescue Rope 10-foot Multi-Function Leash that transforms into a hands-free leash, slip lead and double leash. The price is $34.99 USD. Ruff Rescue Rope is excellent; I loved using it as a regular leash, a slip lead, and a hands-free leash. Although I do have an arsenal of leashes, I did not have a 10-foot leash, which is perfect to practice recall and for hiking. Ruff Rescue Rope is one of the strongest, most durable leashes I own. I would trust this leash over any others for intense hikes, walks, or runs. After a muddy hike, it was very easy to clean in a mesh bag. I like how Ruff Rescue Rope is environmentally friendly, too. You can learn how to adjust the leashes by watching the tutorials. I am not an auditory/visual learner, but it was fine since I could pause and replay as much as I needed. I also came up with my own hands-free, double leash creation. The Ruff Rescue Rope is easy to adjust and change from one leash setting to another. I would strongly recommend purchasing a leash from Ruff Rescue Rope. Not only will you thoroughly enjoy your leash, but you will help a dog get out of a shelter and go with a veteran. Thank you, Ruff Rescue Rope! Make sure you follow Ruff Rescue Rope on Facebook and Instagram. Disclosure: Ruff Rescue Rope gave me a 10-foot Multi-Function Leash complimentary in return for a review on Realm of Vibes and social media. All opinions within are my own. If you are interested in your products being featured on Realm of Vibes, please visit my Contact page or e-mail realmofvibesdg@gmail.com for details. This is a fun and easy way to raise money. Ask the brewery or winery for a portion of each beer, tasting, growler fill, or wine bottle purchased to be donated to your rescue organization. Some breweries and wineries will let you bring dogs to hang out; it is a great way to raise awareness of your organization while sipping on delicious beers or wines. The last fundraiser I ran at a brewery raised over $450 in four hours. We received $2 for each pint purchased during a set time period and had donation cans located throughout the brewery. Many chain restaurants have a dine to donate program where a percentage of the total food purchased is donated to your organization. You may have to show a flyer or a ticket for the donation to count. Most restaurants have application forms online; creating a no-hassle progress for the organizer. The dine to donate fundraisers may not bring in an exorbitant amount of money, but little work is involved besides handing out flyers. This is the new wave of fundraising! Companies that sell clothing, essential oils, kitchen utensils, and cosmetics on social media, often have fundraising programs on Facebook! Login to the consultants’ event from the comfort of your own home and shop ‘till you drop. A percentage of all items sold will be donated, and the company may match total proceeds. I have worked with two consultants and we have raised over $500 on Facebook. Many supermarkets will provide food for your fundraising event. Bring in a 501 (c) (3) paper and a letter stating that you are requesting the supermarket to make a food donation. Some stores will offer you a sandwich or cheese platter, while others will provide you with a gift card to select your own items. Make a sign that reads “Help Yourself to (insert food here), Donations Greatly Appreciated & Accepted” and place a donation jar next to the food you have available. This will encourage people to eat, but also remind them to donate to your rescue organization. Give yourself six to eight weeks to adequately promote your event through flyers, word of mouth, and social media. Ask the venue or restaurant if you can distribute marketing materials such as pens, pencils, magnets, business cards, dog waste bags and dispensers, and other dog related items. If you are doing a virtual fundraiser, ask if you can do a giveaway. It is also important that you have a clipboard ready to obtain e-mail signups for future adoption events and fundraisers. If you set up a table, make sure you have appropriate signage and a donation jar. All volunteers should look uniform; t-shirts with your organization would help you to stand out amongst the crowd. The word fun is in fundraiser for a reason. Mingle with your supporters, bring awareness to dog rescue and your organization, hand out promotional materials, and network to obtain potential adopters, foster parents, and volunteers. Fundraising is key to making sure a constant flow of funds enters the bank account to meet the needs of the dogs in the organization. Assign one or two fundraising coordinators to start planning your next event today! Every foster parent and rescue organization knows the importance of taking good pictures of dogs that are available for adoption. It’s similar to online dating. Adopters scan websites to search for the perfect canine companion. What’s the first thing they notice? Fido’s picture. Kelly Andrews, owner of Etsy shop, Just Dog Gone Cute, kindly donated ADOPT ME collars to Caring Canine Connections. Thank you, Kelly! We know these collars will bring many happy adoptions! Bailey, not for adoption, but a great model! Just Dog Gone Cute has over 450 items for sale including dog and cat collars, leashes, flower head bands and hats. You can find a collar or leash for any special need or occasion, like “Do Not Pet” or a “Happy Birthday” collar. The assortment is extensive, including holiday, wedding, patriotic and seasonal items. I was immediately drawn to the Adopt Me/Rescue/Blessed section as we want potential adopters to know that the dog is available, especially at adoption events and in public places like the pet store or park. These ADOPT ME collars help our foster dogs stand out in the crowd. Just Dog Gone Cute’s collars arrived in adorable packaging. Each collar was individually wrapped in paw print tissue paper. A hand-written message was included, adding a personalized touch. The ADOPT ME buckle collars are so bright and fun! They are easy to adjust (remember to leave at least a two-finger width in between your pet’s neck and collar). They feel very study, but are soft against their skin. I feel confident that I could hand wash or put these in the washer (in a mesh bag on delicate) and they will stay intact. (Bailey and my foster dogs love to play in the dirt, so a washable collar is important.) Heath, my foster dog, was show stopping in the green collar. It really stood out against his shiny black coat. I love how Just Dog Gone Cute has a variety of color options: yellow, pink, red, orange, light and dark purple, green, and blue. There are a wide range of collars (extra small through large), buckle, martingales (fabric or chain), and leashes (four through six feet, one sided or double sided). You could also purchase a ribbon collar or just the ribbon only. An English idiom says it best, “A picture is worth a thousand words.” Realm of Vibes and Caring Canine Connections thank Kelly for donating the super cute ADOPT ME collars. They are giving a fresh, lively look to the foster dogs in our care. In addition to shopping at Just Dog Gone Cute on Etsy, make sure you like Just Dog Gone Cute on Facebook! Would your business or service like to be featured on Realm of Vibes? Please visit the Collaborate page or e-mail realmofvibesdg@gmail.com to get started. 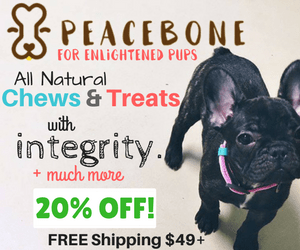 Disclosure: In return for donating collars to Caring Canine Connections, Just Dog Gone Cute is featured on Realm of Vibes and social media platforms. Although collars were received complimentary and as a donation, all opinions within this post are honest and authentic. Caring Canine Connections could benefit from donations to aid in the care of our foster dogs. Please support artists, small businesses, and rescue organizations. Make the world a happier place! Namaste. I had a slice of American cheese in my hand. I was laying prone down my foyer stairs trying to coax KiKi, my Akita/Belgian Malinois foster dog up the stairs. The owner of the rescue came to my house with her Suburban full of dogs. She wanted to make sure that whichever dog she gave me got along with my dog, Bailey. When I met KiKi, she pressed herself up against the crate, indicating she was scared and not wanting to leave her safety zone. I turned to the rescue owner and said “You get her out! I’m not! She’s going to bite my face off!” With lots of coaxing, a calm voice, treats, and gentile manhandling, KiKi was free from the confines of the crate and on a leash. We took a quick walk to make sure her and Bailey were friendly enough to be off leash in the backyard. Bailey ambushed her, but KiKi looked to Bailey as a big sister, showing her the ropes of our palace. KiKi was a dog from the South. I knew nothing of her background, so I formulated a story in my head. KiKi was an outside dog, she was never inside a home because she didn’t know how to go up and down stairs. A toy was a foreign object, one that peaked her interest, but she would approach cautiously, unsure of the toy’s intentions. She didn’t trust humans, either. Whoever had her, was a prick. She wanted nothing more to be outside. That is no life for a dog. Bailey, Ace, and Jack (my furfamily) are treated better than some humans. I love them more than myself. The first night with KiKi was one for the books. We live in a bi-level, so stairs are a necessary evil. There is 7 steps to the front door. Once inside, you can either take 7 steps upstairs or 5 steps downstairs. KiKi entered through the downstairs entrance, and that is where she remained. She was not going anywhere near the stairs. She went outside and inside through the downstairs entrance only. I thought to myself, “How can I turn this outside dog into an inside dog?” She wasn’t fond of the crate (again, outside dog mentality), so I laid a warm red blanket down for her on the floor. She wouldn’t eat, wouldn’t drink water, and would just stare at me, as if to say, “What am I doing here?” I was heartbroken. She looked so sad. She wanted nothing that I had to offer. I slept with her on the red blanket. I just felt like she needed someone on her side, to know that I was there, with her food and water, and that we were going to get things right. She was in my care, and I was going to protect her and get her adopted to a good home. One of the most challenging things I had to do was teach KiKi to go up and down the stairs. Not only did we have to master the inside stairs, but we had to master both sets of outside stairs. I think I learn something new every time I have a foster dog that can’t do something. I tried putting Pupperonis on each step. No cigar. She would just eat the treats on the first two steps and then run away. I tried having Bailey be the example. “See! Look. Bailey! Come.” Bailey would run up the stairs and I would give her a pet and a treat. KiKi would whimper in disgust and aggravation. I tried placing her gently on the steps, in which she would shake, and it no longer became a positive, happy experience. So, I laid prone on the steps with cheese in hand, and Bailey next to me for moral support. Nope. She wouldn’t budge. I got Jason to lay prone and hold cheese, and I guided her legs up the stairs. Finally, she did it. And we practiced, and practiced, and practiced some more. Two hours later and we had KiKi running up and down the stairs. Positive reinforcement. Success. It took another day to teach her how to go up and down the outside steps. Baby steps. KiKi had an application for adoption. The man walked many miles each day and wanted a dog to walk well with his dog. KiKi, thankfully, was amazing on a leash. After almost six days with me, she was a new dog. She pranced. She slapped her paws against the ground, happy to be alive. She saw me get the leash out of the closet and would run down the stairs by the door. I loved taking her on walks because we were both in our happy place; me, getting my exercise outdoors, and her prancing down the street, sassy as ever. I don’t know the rest of KiKi’s story. Some of the adopters and I keep in touch through text messaging or social media facets, but KiKi’s life is a mystery. Last I heard, her family loved her, and that she was walking miles each day, happily, with her canine sibling. Whether it takes me two hours guiding a foster dog up the stairs to get her to the American cheese prize or sleeping on a blanket on the floor, I will do anything to make these dogs feel safe, happy, and alive. I get unconditional love, and gratitude for life, and they get the skills they need to become an adoptable, well behaved canine companion. Happy trails, KiKi. Win-win for all.